One thing that I just couldn't fail to notice is the presence of Hindu religion (mythology) in the city. 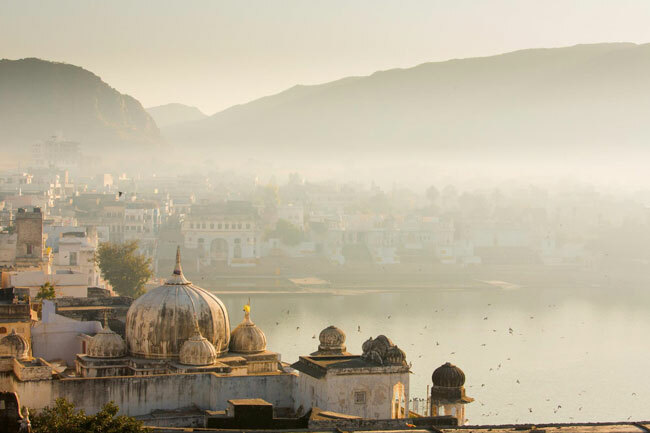 There are stories associated with almost everything in sight, be it the formation of the city, the rule of Raja-Maharajas in the city, The Brahma Temple, or The Pushkar Lake. 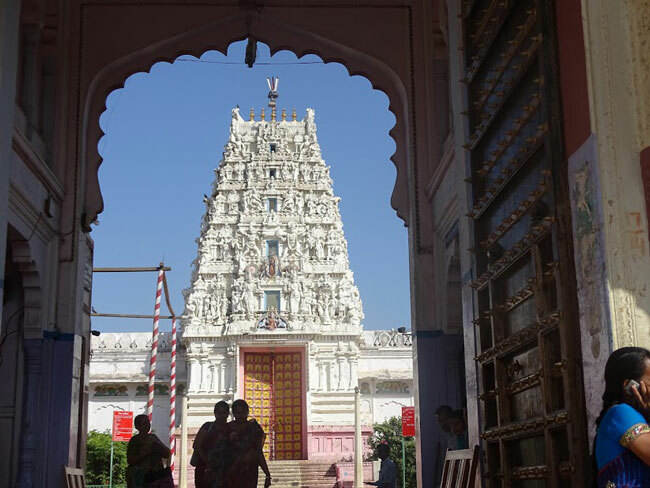 While walking through the narrow lanes of Pushkar, I met a guide who told me more about The Brahma Temple. I was told that the temple was built in the fourteenth century and that it was the only place on Earth where Lord Brahma landed at to perform Yagya with other gods and goddesses. The temple was more magnificent than I could ever imagine. It was crowded by Hindu pilgrims who came to the temple with their strong beliefs. With a red spire and an image of the sacred goose, the architecture of the temple is still etched in my mind. 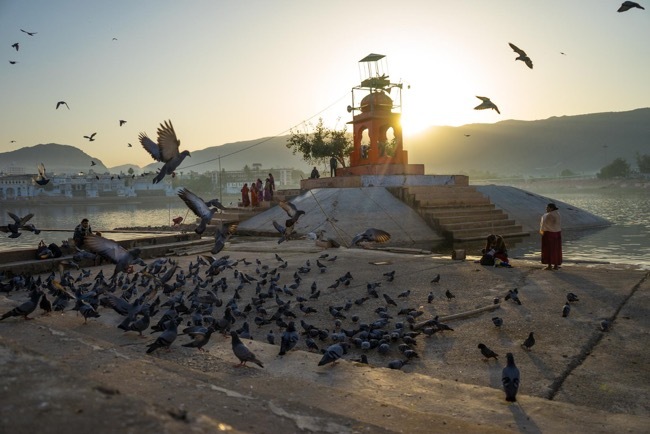 A visit to the temple ensured a visit to the holy Pushkar Lake. One of the most beautiful lakes in Rajasthan, it is surrounded by sand dunes and the serene Aravali Hills. The lake also holds religious significance to Hindus who believe that a ritual dip in the lake is very auspicious, and so I did take my chance. One of the women I met in The Brahma Temple told me that I should also visit the Old Rangji Temple which is dedicated to Lord Vishnu. With no other plans, I decided to visit the Rangji Temple. The temple was buzzing with pilgrims and the architecture of the temple reminded me of the ones I had seen in the southern part of India. I got to learn so much about Hindu culture and religious beliefs by visiting this temple. The temple also had to offer music and Yoga classes which are equally enlightening. I decided to halt at Cafe Enigma which offered me a fulfilling dinner with one of the best Malai Koftas I have ever had. With the breathtaking rooftop view of Pushkar, the Cafe became my instant favorite. I was pretty tired after the happening first day and decided to curl up in my bed for a peaceful night. By now, I had decided to check out of my hotel. I had met a backpacker from Amsterdam at the Rangji Temple who told me about the hostel he was staying at. It was called Zostel. I decided to give it a try but I was a bit sceptical because I thought that the concept of a hostel was alien to India. But I was so wrong. Zostel turned out to be a backpackers’ dream! After checking into Zostel and putting my luggage in the locker in my room, I went out for a quick banana pancake breakfast. Next on my list was The Apteshwar temple. I could not help but notice that there were a lot of people who offered Dahi, ghee and leaves to the Shiva Lingam. 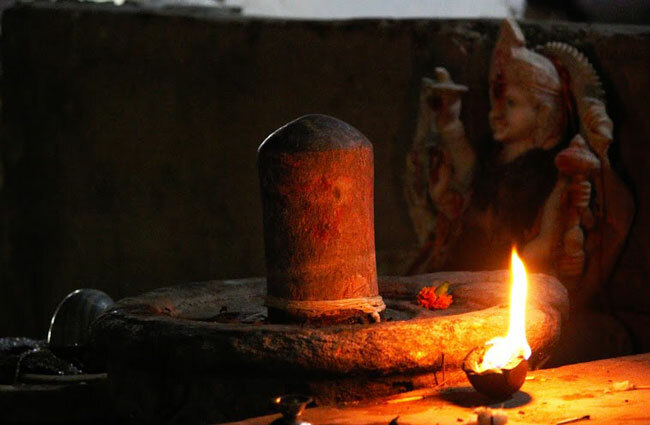 My curiosity was then answered by a Pujari who told me that offering 'Bel' leaves to the Shiva Lingam helps in fulfilling our wishes. My next stop was the Man Mahal, which was made by Raja Man Singh as a guesthouse for him and other guests. The palace still has an air of royalty which gives it a majestic charm. With an exhilarating view of the banks of the lakes and the warm hospitality of Rajasthan Tourism, the palace still functions as a hotel. After my Pancake breakfast, I wanted something authentically Rajasthani for my lunch and so I decided to head to Lakshmi Mishthan Bhandar which served me one of the best Rajasthani Thali and Malpuas I have ever had! On my way back from there, I came across these vibrant wall-mural which instantly grabbed my attention. Next on my list was the Camel Safari. Even though I was a little scared of the height that camels offer, I could not miss it. They took me through various villages on the sand-dunes which offered a glimpse of how different the life of the villagers was. Their simple days, music-filled evenings and the authentic food which had the local flavor of the dunes took me to a simpler state of mind, away from the rat race this world offers us every day. My second day offered me a glimpse of a simpler life, and I liked it. Checking in the hostel, I just wished to share it all, but once on the bed, it took me no time to drift off to deep sleep. I woke up with unmatched excitement today because I knew what was in turn today. My favorite thing to do in any city is to explore its buzzing streets and the markets. Pushkar's markets with their peculiar character is something to boast about. I wanted to buy some souvenirs which would remind me of the amazing journey of this holy land. I headed to the Sadar Bazaar which has a flock of cafes and small eateries. I decided to have Hummus and Falafel wraps at the Falafel Wrap stall in Sadar Bazaar and it is worth every single penny. 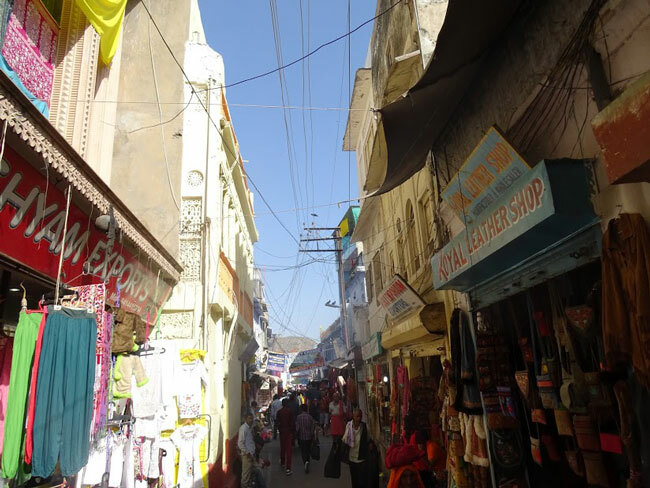 I decided to walk through Kedalganj bazaar, Sarafa bazaar, and the famous Pushkar bazaar. All three of them looked like a heaven to me, just like it would to any other shopaholic. The markets were flooded with handcrafted textiles, embroidered covers, idols of Hindu gods and goddesses, miniature paintings, bangles, leather goods, etc. One more thing that the market boasts in Pushkar is 'Baba- The Cosmic Barber'. A hero of infinite video blogs, this barber speaks fine English and uses the marrying chakra system that focuses on energy flow to thrash all the negative energies just by a massage. If up for some adventure, let him do his signature massage. 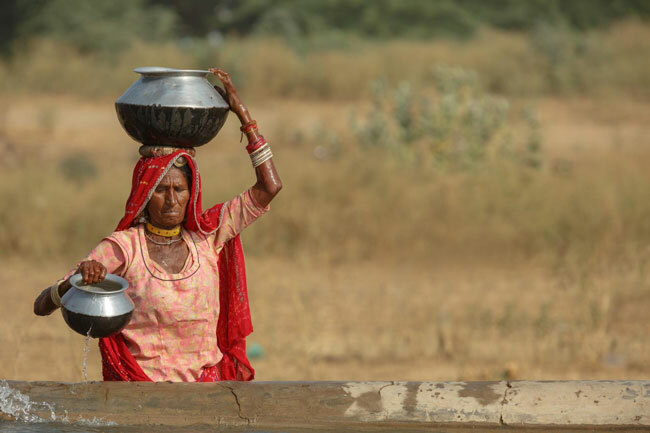 My three days in Pushkar were otherworldly. The numerous ancient stories associated with this city are not very hard to believe once you enter the town. It is just not a 'Teerth-Raj' for religious Hindus, but also boasts a parallel laid-back hippy culture which you can't miss. I got the best of both worlds at this place, where time seems to have stopped!